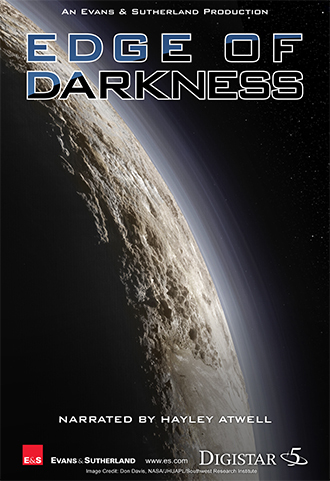 Edge of Darkness features amazing scenes of places never before seen, gathered by key space missions that culminated with groundbreaking discoveries in 2015. Experience a spectacular flight through the great cliffs on comet 67P, a close look at the fascinating bright "lights" on Ceres, and the first ever close-ups of dwarf binary planet Pluto and its moons. Narrated by Hayley Atwell, Agent Carter, from the Marvel Cinematic Universe. Recommended for adults and youth 11 and older. Genesee County Resident Admission*: $3 adults, $2 seniors 60+, and $2 youth ages 2-11 >> Purchase at the door or by phone to receive the discount. Tickets are available at the door, but please note that shows sometimes sell out. Genesee County residents and members may call 810-237-3400 to purchase tickets in advance. Non-residents may click the button below to purchase online.